Rosemarinus prostratus 'Bonnie Jean'. This grows on the south side of our house, so I only see it when I walk around the garden. If I had more sun near either door, I'd happily move it to where I could enjoy its bright blue flowers as I come and go in the winter months. The proud flowers of Camellia sasanqua 'Yuletide' got iced over the last three cold nights. I'm sure the buds that open later will be fine if we don't have a repeat freeze at exactly the wrong time. Several blooms on Rosa 'Perle d'Or' are hanging on in a covered area. Daphne odora 'Variegata' is showing lots of color, though not yet fully open. The remnants of Fatsia japonica blooms still adorn the plants near the front door. Indoors, an Aglaonema is blooming. And the Schlumbergera is putting out a solitary, intensely orange bloom. Visit our host, Carol, at May Dreams Gardens to see what's happening in other January gardens. Happy Bloom Day! While most of the world is now focused on looking forward, I want to savor the past year in the garden one more time before I move into 2013. Here's a brief retrospective of my 2012 gardening year, with each month showing some favorite plant action. 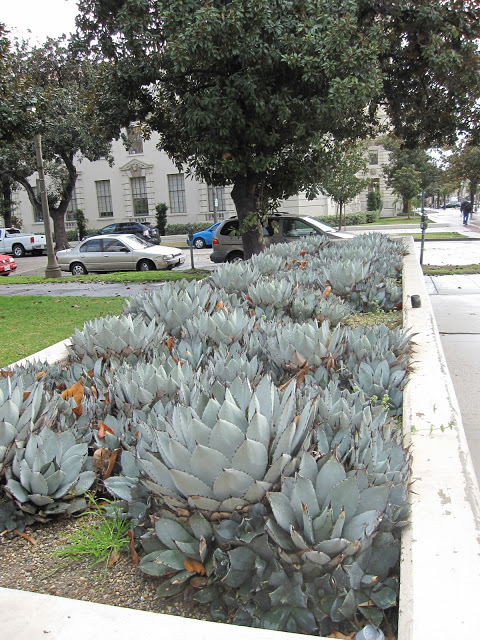 In January we visited Pasadena, where I spotted this huge planter full of Agave parryi var. truncata. In February, I was heartened to see Arctostaphylos x 'Austin Griffiths' beginning to bloom. March is such a wet month here in the PNW that I have learned to embrace moss in all its forms. 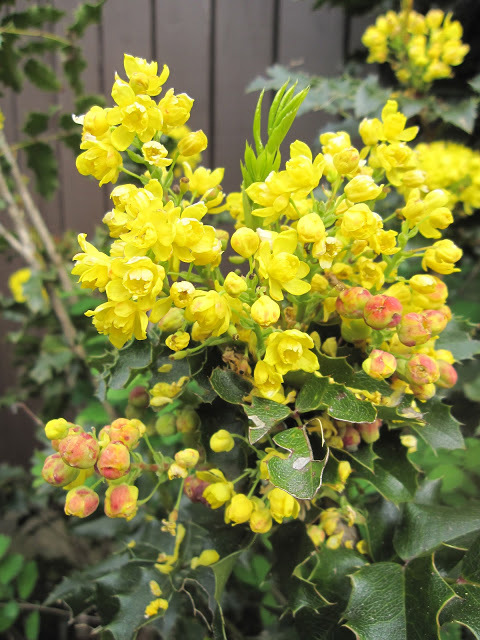 The Northwest Territory shone in April as Mahonia aquifolium bloomed. A sea of Helianthemum set off the steely blue spikes of Yucca rostrata in May. My favorite color, orange, plays out in June as Phygelius 'Passionate' fronts Trachycarpus fortuneii. In July, I visited the hillside McCulloch garden as part of the Hardy Plant Society's Open Gardens program. Meliathus major 'Purple Haze' looked good enough to eat in August. Its scent, reminiscent of honey, explains its common name of Honey Bush. September is the month for Caryopteris blooms in a saturated shade of periwinkle blue. 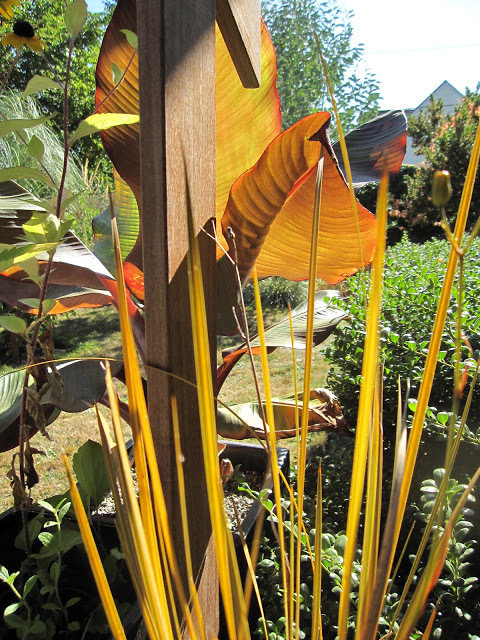 With perfect fall coloring, Libertia peregrinans 'Broad Sword' and Ensete ventricosum 'Maurelii' warmed up October. In November this NOID heather turned a lovely orange and set off Yucca rostrata's cool blues. The fun of sputnik blooms on Fatsia japonica is a great way to end the year in December. And with that fond look back at 2012, I may actually be ready to move forward into 2013! Happy New Year!